Technological revolutions -- not simple biology -- led to the emergence of modern humans. Skulls of a Neanderthal from Amud (not pictured) and an early human from Skhul show morphological differences between the two groups. Neanderthals living just 60,000 years ago in nearby Kebara Cave fashioned the flaked point, probably used on the tip of a spear. A Neanderthal point from Hayonim Cave was made about 130,000 to 180,000 years ago, and belongs to a group of Middle Paleolithic industries characterized as Early Mousterian. Most Neanderthal groups are believed to have continued using so-called Mousterian tools through the Middle to Upper Paleolithic revolution. A Neanderthal man dated to about 60,000 years ago, found in a dug-out grave in Kebara Cave on Mount Carmel in northern Israel. The shape of the man's hyoid bone, which controls the tongue, suggests that he was capable of speech. His skull had been removed without disturbing the other bones after the flesh had decayed, perhaps as part of a symbolic mortuary practice. 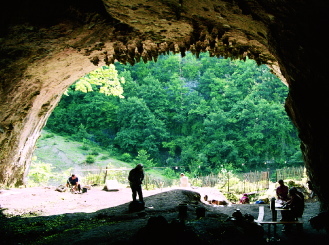 Views from inside and outside Dzudzuana Cave in the Republic of Georgia. Bar-Yosef and colleagues are working to date the Middle to Upper Paleolithic transition here in the Caucasus foothills, where it may have occurred much later than in other parts of Europe. 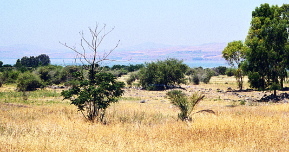 A natural field of wild cereal near Lake Kinneret (the Sea of Galilee). The domestication of wild grains began in the western wing of the so-called "Fertile Crescent"--not throughout the region as we are often taught--and spread from there. 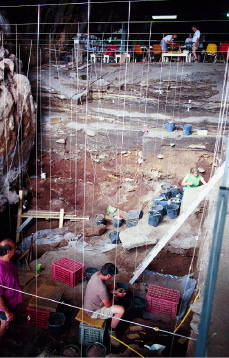 Archaeologists at Hayonim Cave in the western Galilee, Israel, use a three-dimensional grid (right) to place objects in the proper chronological sequence. 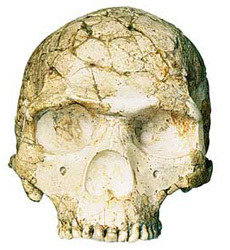 Bar-Yosef, with American, French, and Israeli colleagues, has been studying the emergence of modern humans there with sponsorship from the National Science Foundation and the French Ministry of Foreign Affairs since 1982. 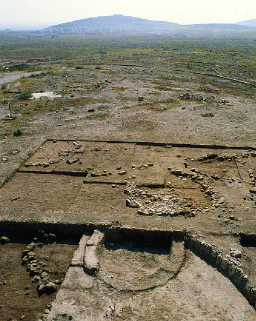 Houses in early Neolithic villages like Netiv Hagdud in the Jordan Valley were oval. Artifacts recovered from Neolithic sites--like the 9,000-year-old stone mask from Nahal Hemar Cave (below)--in their number, variety, and state of preservation--allow archaeologists to form a detailed picture of how technological and cultural innovations spread. Colonization routes during the Middle Paleolithic were often similar to paths of dispersion during the Neolithic Revolution. 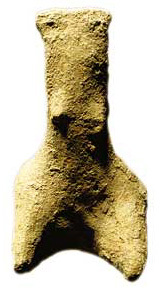 A clay figure from Netiv Hagdud in the Jordan Valley illustrates the proliferation of female representations during the Neolithic period. 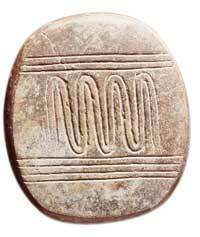 This incised and polished pebble from Netiv Hagdud, 11,000 years old, displays a meandering pattern between parallel sets of horizontal lines that perhaps represents a river. There was a single birch tree that had overtopped the other trees on the island, and was now picked out against the moon-drenched sky. It was very thick at the base, unduly thick, and as Lok watched, impossibly thick. The blob of darkness seemed to coagulate round the stem like a drop of blood on a stick. It lengthened, thickened again, lengthened. It moved up the birch tree with sloth-like deliberation, it hung in the air high above the island and the fall. It made no noise and at last hung motionless. Lok cried out at the top of his voice; but either the creature was deaf or the ponderous fall erased the words that he said. So William Golding imagined a prehistoric encounter between Neanderthals and our ancestors, Homo sapiens. In 1955, when he wrote the novel describing a preliterate society gradually exterminated by a more modern civilization, our understanding of this Stone Age encounter was sketchy. Scientists could not even say whether Homo sapiens sapiens had lived at the same time as Neanderthals, or instead were descended from them. But in the last 10 years, a much more complete picture has emerged of what happened--40,000 years ago--when the last two branches of the human family tree met, and one prevailed. Neanderthals were not as primitive as they are often portrayed in popular culture. They were humans like us, and their brains were at least as big as ours. They were larger and stronger, and were successful hunters of big and small game. They probably even had language, which is generally thought to have arisen between 300,000 and 400,000 years ago. They were, in any case, anatomically capable of speech. Their stocky bodies are thought to have made them well adapted to the northern latitudes and glacial climates of Europe, where they lived for at least 300,000 years--far longer than we have. "Most humans in the last half a million years, and possibly earlier, were basically hunters and gatherers," says Ofer Bar-Yosef, who since 1982, with a team of French, Israeli, and American colleagues, has been studying the origins of modern humans in the Levant, the lands along the eastern coast of the Mediterranean Sea. "From time to time, all hunters are also scavengers, just like us when we go to the supermarket: someone else killed the animal, we are just going to get the meat. But most of the time they were hunters." And in hunting, success depends on your tools and social organization. "If you have bows, arrows, spears, and then snares, traps, and nets, you can catch everything and feed your group very well," he says. "But if you are not yet at the point of inventing these things, you cannot do this." The MacCurdy professor of prehistoric archaeology speaks with a thick Israeli accent, and with a perpetual twinkle in his eye. "The basic comparison would be, that before the invention and spread of the computer"--the twinkle is especially apparent now--"the number of scientific papers and journals was much smaller than it is today. So we go through technological innovations," he continues, "which sometimes are driven by needs and sometimes result from good timing." One of these innovations took place 40,000 to 50,000 years ago when a half-million years of essentially unchanged human behavior abruptly ended. Hunting continued, but the number and range of human-occupied sites rose dramatically, suggesting a rapid population increase. Settlement patterns shifted. Even the artifacts show a startling new variety. Archaeologists, though they disagree about what triggered the sudden change, refer to this period as the Middle to Upper Paleolithic (MP/UP) transition. Many of them call it a revolution. Bar-Yosef believes that the MP/UP was the first of several such major revolutions, and the one that allowed our ancestors to outcompete the Neanderthals and eventually dominate the planet. "Neanderthals and modern humans not only lived during the same time," he says, "they sometimes, in a boundary zone, occupied the same cave sites." 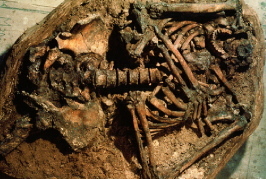 In fact, it was Bar-Yosef and his excavation colleague Bernard Vandermeersch who shattered the hypothesis that we are descended from Neanderthals when, in the early 1980s, they proposed that the modern-looking human skeletons at Qafzeh Cave in Israel, which proved to be 90,000 to 100,000 years old, were contemporaries, not descendants, of Neanderthal populations. Discoveries within the last 20 years suggest that some Neanderthals even had the capacity for symbolic behavior--long thought to be a "modern" distinguishing characteristic of our Homo sapiens ancestors. In France, a discovery of Neanderthal remains with Upper Paleolithic artifacts--the kind only modern humans were supposed to have made--further challenged all the preconceptions we have had about Neanderthals. If they were making modern tools, what caused us to flourish, and them to disappear? Bar-Yosef tackles the question with the techniques of a biogeographer: he not only conducts excavations, but surveys the work of others and tries to fit all the pieces of the puzzle together by analyzing geographical movements of cultural phenomena and peoples through time. He is untroubled by arguments about whether the French Neanderthals made or merely traded with modern humans for those Upper Paleolithic bone tools. The archaeological evidence reflects a gradual demise, he says--Neanderthals disappeared first from southeast Europe where it borders the Near East, some 40,000 years ago. Modern humans, also known as Cro-Magnons, moved slowly westward. One route was along the Mediterranean coast and another, farther north, along the Danube River. By taking over certain territories, Cro-Magnons fragmented the Neanderthal continent of Europe, causing the isolation of their residual populations. Neanderthal sites just 30,000 years old have been found on the Iberian peninsula, suggesting that this indigenous group was able to hold on in the face of colonization by Homo sapiens for more than 10,000 years. An apparently 29,000-year-old Neanderthal skeleton recently uncovered in a cave on the northern slopes of the Caucasus Mountains in Russia has its discoverer under fire from other paleoanthropologists who question the date and the context of the burial. Bar-Yosef is unfazed. "Why worry about [how recent the site is]?" he asks. "The evidence we retrieved in our joint excavations with Georgian colleagues in the southern foothills of the Caucasus places the Middle to Upper Paleolithic revolution in this region as late as 30,000 to 32,000 years ago." Bar-Yosef's insight is that the revolution did not take place at the same time everywhere. It began in a particular area, and then spread. And almost everywhere, when the new people arrived, the Neanderthals began to retreat or vanish. As to the nature of modern human/Neanderthal contact--whether the two groups fought, mated with, or ignored each other--he says, "The stones are silent." Precisely why the Neanderthals disappeared remains a mystery. What can be answered, according to Bar-Yosef, concerns the nature of modern human expansion: what happened, where, and when. Curiously, modern DNA analysis has given new life to archaeological approaches to answering these very questions. Even as improved scientific tools like better dating techniques have allowed archaeologists to compare the age of geographically distant sites with much greater accuracy, DNA sequencing has allowed population geneticists to characterize relationships between hominids, to estimate prehistoric population sizes, to pinpoint branchings in the human family tree, and to date biological changes in our genome. individuals survived near-extinction events). The only viable samples of Neanderthal DNA from two geographically distant individuals show less variation, for example, than is found in a modern band of chimpanzees--though the samples show that Neanderthals were not as homogeneous as are modern humans, suggesting that we had some even closer brushes with extinction ourselves. Perhaps most importantly, DNA analysis tells us that the last biological change leading to anatomically modern humans took place between 100,000 and 300,000 years ago (though there is no evidence of it in the archaeological record). And that means that biology cannot explain what happened between 40,000 and 50,000 years ago during the MP/UP revolution. Bar-Yosef had already reached similar conclusions by 1980, when he and his colleague Vandermeersch realized that the skeletons at Qafzeh Cave, which are anatomically modern, predate the MP/UP revolution by 50,000 years. But the possibility remains, as suggested by Richard Klein of Stanford University, that a neurological change unaccompanied by anatomical differences had precipitated the revolution, a proposition that is archaeologically untestable. Although DNA analysis has not yet resolved this issue, the archaeological evidence strengthened Bar-Yosef's conviction that the MP/UP revolution could reasonably be compared to other, later revolutions, in which we know that biology was not a factor. Could the MP/UP revolution have been a technological and cultural change like the Industrial Revolution? That revolution had profound impacts, Bar-Yosef points out, "but no one argues that the Industrial Revolution was precipitated by a biological change." Several years ago, Bar-Yosef recognized that if biological explanations for the MP/UP revolution could be set aside, then the Neolithic Revolution that took place some 30,000 years later could provide an excellent model for understanding the earlier transition. He therefore began to refocus his work on the origins of agriculture. During the Neolithic Age, the foragers became farmers. Cereals, legumes, and then animals were domesticated, villages appeared, and buildings that suggested symbolic or religious use were built. Taking the analogy one step further, Bar-Yosef (and others) borrowed terms used to describe the spread of the Industrial Revolution, identifying "core" and "peripheral" areas for the rise of particular Neolithic innovations, and tracing their geographic movements through time. There are a number of advantages to this approach, says Bar-Yosef. First, the Neolithic Revolution involves just one species. There are no Neanderthals to complicate the picture. And much more information is available: there are more sites to study, and many well-preserved artifacts that allow the movement of innovations--which, as in the MP/UP revolution, show a clear linkage between the Near East and Europe--to be mapped. The Neolithic era also falls within the 40,000-year range of radiocarbon chronology, making sites easily datable. (In some areas, such as Scandinavia and southern Siberia, agriculture arrived only between 3,000 and 5,000 years ago.) And in many countries, agriculture is still the dominant way of life, allowing anthropological studies to supplement the data-rich archaeological record of the Neolithic. Archaeologists believe they know what triggered the Neolithic Revolution in the Levant: climate change. A cold and dry period called the Younger Dryas occurred between 11,600 and 13,000 years ago. This led to a decline in the plant and animal resources on which human subsistence strategies relied. The reactions of foraging societies to the climatic hazards varied according to the social history of each group. 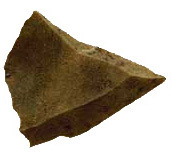 For example, one hunting and gathering society in the Israeli Negev (known as the Harifian) responded by improving hunting techniques with a sophisticated new arrow point--but this approach failed after several hundred years, leading to abandonment of their homeland. Another group, in the Taurus Mountain foothills in Turkey, established a sedentary community, marking its permanent hold over a territory and its resources. In other human settlements within the natural habitat of the cereals, intentional cultivation began, leading within a millennium or more to the appearance of domesticated forms. Only later, after the end of the Younger Dryas, with the onset of wetter conditions, came the introduction of tended goats and sheep from the foothills of the Taurus and Zagros Mountains. By the end of the first millennium of the Early Holocene, about 11,000 years ago, emigration from the core area led to rapid expansion of agricultural societies. When looking backward from the Neolithic Revolution, one might observe that the trigger for the Middle to Upper Paleolithic revolution is unknown. But then, neither is the core geographical area, says Bar-Yosef, who has documented some of the earliest known sites in the Levant. 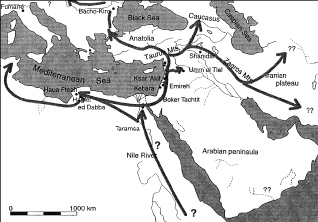 There are indications that the changes in subsistence strategies and hunting techniques may have originated in East Africa, in which case it should be possible to document the transmission of the culture up the Nile Valley. And if the core area can be found, it may be possible to characterize what environmental conditions and social constraints--climate change, or perhaps demographic pressures--caused it. Though Bar-Yosef is skillful at painting the "big picture" for visitors to his laboratory in the Peabody Museum, it is also clear that he is an expert on the minutiae of fieldwork. His collection of slides, housed in vertical backlit trays, illustrates a lifetime of meticulous excavation and every point imaginable relating to the emergence of modern humans. He can as easily describe the sweep of agriculture into Europe as he can the painstaking study of the biogenic impacts at a particular cave site--everything from disturbances of prehistoric artifacts by burrowing rodents, to earthworm activity, to accumulations of bat guano and millimeter-sized pigeon gizzard stones--all of which can confuse the archaeological record. Evidence for the use of fire, a modern behavior common to both archaic Homo sapiens and Neanderthals, is now traced, he explains, by analyzing phytoliths: tiny silica crystals in plants that accumulate in hearths where wood, sticks, and grasses are burned repeatedly. (Fire's earliest proven use goes back 500,000 years.) If he were at the beginning of his career, he says, he would dedicate it to a search for the MP/UP core area--in East Africa, perhaps in Kenya. At his computer, which he uses to generate maps showing the movements of peoples and technology during the Middle to Upper Paleolithic and Neolithic revolutions, Bar-Yosef's penchant for analogy reappears. He calls his Macintosh "the best computer," but adds, "The manufacturers did the wrong thing for a number of years. It shows you that it is not always the best invention that gets to be the most well-distributed one. That applies to prehistoric times as well." He is perhaps referring to the ill-fated Negev Harifians and their improved spear points--though there are other examples. Two of his maps show how the Middle to Upper Paleolithic revolution resembles the Neolithic. What at first appears to be a chaotic smattering of dates across Europe and the Levant resolves itself into a pattern. Each date corresponds to a site with documented human occupation between 30,000 and 50,000 years ago. Some contain Upper Paleolithic artifacts, others artifacts that clearly belong to the late Middle Paleolithic period (known as Late Mousterian), but that are contemporaneous with Upper Paleolithic technologies. 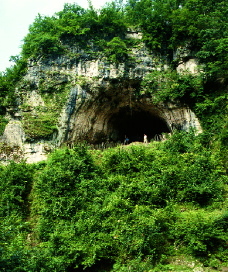 Many of the sites lack identifiable human remains, so it is not possible to say whether Cro-Magnons or Neanderthals lived there. The general trend becomes clearly visible, though, when Bar- Yosef points it out: the oldest sites with Upper Paleolithic artifacts occur in the Levant, and similar sites gradually spread west and north into Europe as time goes on. At sites where Middle Paleolithic artifacts are associated with recent dates, the makers are either known or presumed to be Neanderthals. So what did happen to the Neanderthals? Did their genes mix with ours and become "swamped" by our superior numbers, so that Neanderthal traits are no longer visible in modern humans? Did we ignore them, but compete with them for food resources? Or did we kill or enslave them? "Look to what has happened when other hunter-gatherer societies have met," says Bar-Yosef, or to what happened when European diseases decimated natives of the Americas. Preliminary DNA analysis suggests that Neanderthal genes do not survive in modern populations, even if some interbreeding occurred between them and our ancestors. At this point we don't know for sure what caused their extinction, but looking at the maps gives a pretty good idea. In an afterword to a collection of essays on the geography of Neanderthals and modern humans published last fall, Bar-Yosef and Ford professor of social sciences David Pilbeam suggest, "Neanderthal populations across Europe...became disconnected. Isolated populations are more susceptible to extinction than larger, continuous populations; extinction rates in small populations can vary greatly with quite small differences in demographic parameters. Perhaps this explains why the producers of Mousterian industries lasted longer in certain regions, while in other places they quickly disappeared. We reserve our opinion," they conclude, "as to whether this disappearance was due to the adoption of the new [Cro-Magnon] technologies [by Neanderthals], to interbreeding, or to replacement, although we favor the last." UPDATE: Since this article was published, scientists working with Neanderthal DNA have discovered that most humans today (with the exception of indigenous Africans) share as much as 4 percent of their genome with Neanderthals. The genes are distributed randomly, suggesting they conferred no genetic benefit. Precisely how interbreeding with and replacement of Neanderthals occurred remains a topic of scholarly research.